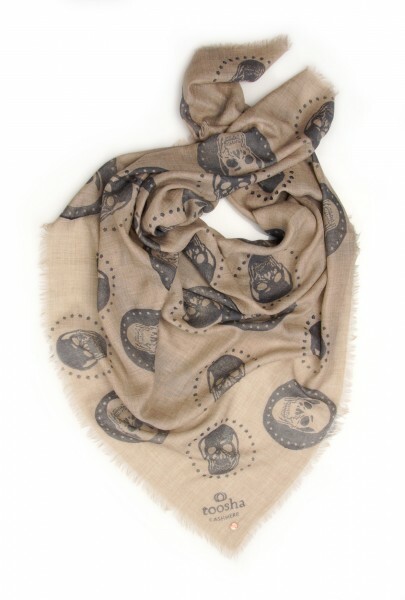 Product information "Eco-Shahtoosh Natural Carré Skull Castlerock"
Our Eco shahtoosh is made of 100% cashmere. It is a tribute to the shahtoosh made from the wool of the Tibetan antelope, which is said to be the "king of all wools". Out of consideration for this endangered species, its wool may no longer be processed. The fine, silky soft fabric for our Eco shahtoosh is therefore handwoven from the pure, undyed wool of the cashmere goat. This is accentuated by a subtle, open fringe. The result is a luxuriously soft cloth so cuddly and tender that you almost forget you're wearing it. Our Eco shahtoosh is available as a scarf (70 × 200 cm) or carré (115 × 115 cm). A special highlight is our print models. We have a large selection of natural colours combined with exciting prints. All models are, of course, printed by hand. This results in particularly classic accents. Related links to "Eco-Shahtoosh Natural Carré Skull Castlerock"